Florida Theatrical Association Presents The Orlando REP Power Chords! The Orlando REP Power Chords are Central Florida’s premier vocal and dance ensemble. 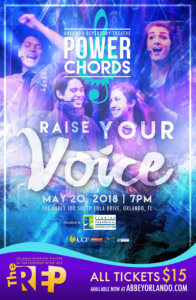 The Power Chords showcase professionally trained youth through a diverse repertoire of high-energy Pop and Broadway musical numbers for audiences of all ages! Upcoming concert May 20th at 7:00pm.